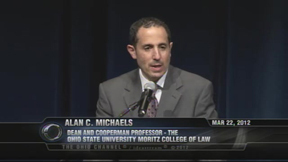 The Ohio Constitutional Modernization Commission and the Ohio State University Moritz College of Law host this Colloquium at the Riffe Capitol Theatre in downtown Columbus. The Colloquium features discussions on other states' experiences with constitutional commissions, Ohio's history of constitutional revision, the role of state constitutions, and procedural options for the Constitutional Modernization Commission. The Ohio Constitutional Modernization Commission is a bipartisan committee charged under R.C. 103.61 with examining the state constitution and making recommendations to the Ohio Legislature. The Colloquium Planning Committee was formed with assistance by the Ohio State University Moritz College of Law faculty to hold a Colloquium for the Commission members and interested members of the public. Experience of Constitutional Commissions Across the States: What Are the Keys to Success or Failure?